The pre-conference session presented by the Michigan Virtual Learning Research Institute Team (Kathryn Kennedy, Joe Freidhoff, Kristen DeBruler, Rebecca Stimson, & Justin Bruno) along with Jered Borum from George Mason University & Michael Barbour from Sacred Heart University was quite interesting. I’ve summarized the highlights here for those interested in the topic. The Michigan Virtual Learning Research team presented their OLOT tool. OLOT is an openly available self-paced learning tool designed to help students understand what online learning involves and introduces the skills and knowledge that are key to success. The question raised was if a student orientation would prepare students for success or by forcing completion of the orientation would that prepare students for “finishing”. Either way (chicken or egg) the data in higher education shows increases in retention so it is a worthy project to add the student orientation! The OLOT tool is described in this get to know OLOT tool booklet. 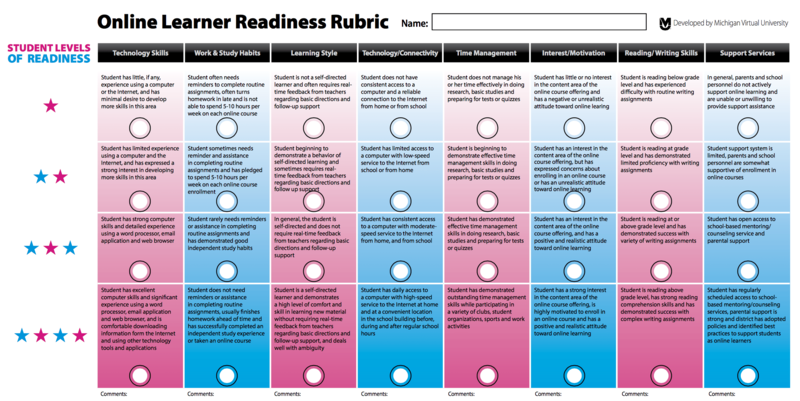 OLOT is used in conjunction with the Online Learner Readiness Rubric (shown below). They are also concerned with teaching teachers to teach online and have developed a guide for mentors who facilitate online learning experiences.